Ribose 2'-O-methylation, the most common nucleotide modification in mammalian rRNA, is directed by the C/D box small nucleolar RNAs (snoRNAs). Thus far, more than fifty putative human rRNA methylation guide snoRNAs have been identified. For nine of these snoRNAs, the respective ribose methylations in human 28S rRNA have been only presumptive. In this study, the methylation state of human 28S rRNA in the positions predicted by the snoRNAs U21, U26, U31, U48, U50, U73, U74, U80 and U81 was assessed using reverse transcription-based methods and several novel 2'-O-methylations were localized. Seven novel ribose 2'-O-methylated residues (Am389, Am391, Gm1604, Gm1739, Gm2853, Cm3810, Gm4156, predicted by snoRNAs U26, U81, U80, U73, U50, U74 and U31, respectively) have been localized in human 28S rRNA. The total number of 2'-O-methylations in human rRNA is not yet known. Ribose 2'-O-methylation is the most common nucleotide modification in mammalian rRNA. In human rRNA, localization of out of ≥ 100 2'-O-methylated residues has been reported (reviewed in ). Most of these ribose methylated nucleotides have been identified from RNase T1 and/or RNase A fingerprints. The remaining 12 or so that unplaced 2'-O-methylated nucleotides, all located in 28S rRNA, typically occurred in very short RNase T1 products; therefore, the precise positions of these 2'-O-methylations remained undetermined with this technique. In addition, 4 of 52 identified 28S rRNA ribose methylations have been mapped to within only two to four nucleotides . Over the past few years, it has become clear that selection of rRNA residues for ribose 2'-O-methylation is directed by the C/D box small nucleolar RNAs (snoRNAs). These snoRNAs contain common features including one or two 10–21 nucleotide long antisense elements complementary to mature rRNA and conserved sequence motifs called boxes C, D, C' and D'. When guiding 2'-O-methylation, the antisense element of a C/D box snoRNA base pairs with the corresponding region in pre-rRNA. Invariably, the rRNA residue base-paired to the fifth nucleotide upstream of the D or D' box becomes methylated in the rRNA [2, 3]. The majority of the identified human C/D box snoRNAs are associated with known 2'-O-methylated nucleotides of either 18S or 28S rRNA (reviewed in ). However, there are also a number of potential methylation guide snoRNAs that possess remarkable complementarity to the human 28S rRNA, but which have not been assigned to a known methylated nucleotide [3, 5, 6]. In this study, we localized seven novel 2'-O-methylated residues in the human 28S rRNA predicted by the existence of the corresponding methylation guide snoRNAs. Thus far, more than fifty putative human rRNA methylation guide C/D box snoRNAs have been identified. For nine of these snoRNAs (U21, U26, U31, U48, U50, U73, U74, U80 an U81) proposed to function in methylation of human 28S rRNA, no corresponding methylated residue has been identified. Putative secondary structures of the duplexes between U21, U26, U31, U48, U50, U73, U74, U80 and U81 and 28S rRNA as well as the predicted methylation sites in rRNA are presented in Table 1.
a Nucleotide numbering of predicted 2'-O-methylations is presented according to the rRNA sequence occurring in GenBank under accession number M11167. Potential duplexes between the snoRNAs and 28S rRNA are presented. Predicted 2'-O-ribose methylation sites of 28S rRNA are underlined and the D or D' elements of snoRNA are boxed. To detect the presence of 2'-O-methylated nucleotides at the sites predicted by the snoRNAs, we used two previously described methods: reverse transcription of partially hydrolyzed RNA and reverse transcription of RNA at low dNTP concentrations . The first of these methods is based on the fact that 2'-O-methylation stabilizes the RNA internucleotide linkage to alkaline hydrolysis and thus causes the appearance of a "gap" in the ladder of primer extension products. In the second method, a characteristic reverse transcription stop occurs on (and/or one nucleotide before) a 2'-O-methylated nucleotide at low dNTP concentrations (0.002 – 0.02 mM each dNTP), but not at elevated dNTP concentration (1 mM each dNTP). However, note that in the experiments presented in this study the primer extension products generated with 5'-end-phosphorylated oligodeoxynucleotide primers migrate about 1 nucleotide farther than the respective sequencing reaction products produced with oligodeoxynucleotide primers bearing a hydroxyl group at the 5' end and terminating with dideoxynucleotides. Using reverse transcription of partially hydrolyzed RNA, we were able to identify five previously undetected 2'-O-methylated residues in the human 28S rRNA: Am389, Am391, Gm1604, Gm1739 and Gm4156, predicted by snoRNAs U26, U81, U80, U73 and U31, respectively (Fig. 1A, 1B, 1C and 1D). Interestingly, Gm4156 is most probably one of the three universal ribose methylations (corresponding to Gm2251 in E. Coli) that are conserved among prokaryotic and eukaryotic rRNA. With reverse transcription at low dNTP concentrations, the presence of a methyl group at Cm3810 (predicted by U74) was observed (Fig. 1E). Before, 2'-O-methylation of either Cm3810 or Cm3811 had been suggested . One previously undetected 2'-O-methylation, Gm2853 (predicted by U50), was identified using both methods (Fig. 1F). In addition, our primer extension experiments confirmed the presence of three earlier determined  2'-O-methylations: Cm2838, Am3794 and Am3799 (Fig. 1E and 1F) that can be also viewed as "internal markers" of our experiments. Modification Am3799 have proposed to be directed by U79 , the snoRNA guides for modifications Cm2838 and Am3794 are not known. Location of novel 2'-O-methylated nucleotides in human 28S rRNA using reverse transcription of partially hydrolyzed rRNA and reverse transcription of rRNA at low dNTP concentrations. The positions of novel 2'-O-methylated nucleotides are shown in bold together with the putative snoRNA guide in parenthesis. Three previously detected methylations Cm2838, Am3794 and Am3799 are also indicated. Lanes 0', 30', 45' and 60' show primer extension products of partially hydrolyzed 28S rRNA, where the hydrolysis time is 0, 30, 45 and 60 min, respectively. Lanes, labeled 1 mM, 0.02 mM and 0.002 mM represent reverse transcription products of 28S rRNA at the indicated dNTP concentrations. Lanes A, C, G and T contain dideoxy sequencing ladders. Note that primer extension products generated with 5'-end-phosphorylated oligodeoxynucleotide primers migrate about 1 nucleotide farther than the respective sequencing reaction products produced with oligodeoxynucleotide primers bearing a hydroxyl group at the 5' end and terminating with dideoxynucleotides. It is interesting that very closely located 2'-O-methylated nucleotides, for instance Am389 and Am391, seem to be methylated by distinct snoRNAs, indicating that snoRNAs bind to rRNA for a short time. On the other hand, incomplete 2'-O-methylation of rRNA population may take place at the close positions. Whether the snoRNAs with partially matching antisense elements influence each others "guiding capacity", remains unclear. We also assessed 2'-O-methylation of human 28S rRNA at positions C2268 and C1296, predicted by U48 and U21, respectively. The detection of 2'-O-methylation of C1296 was hindered by a strong upstream reverse transcription stop caused by 1-methyladenosine m1A1302 (according to ). At position C2268, we observed neither a specific "gap" of partially hydrolyzed RNA nor the appearance of a reverse transcription stop at low dNTP concentration (data not shown). These data reflect the sensitivity of reverse transcription to other RNA modifications, to RNA primary sequence and to secondary structural contexts. Therefore, the reverse transcription-based methods used here are not capable of determining the 2'-O-methylation state of every rRNA position, as has been also observed earlier [1, 8]. 1. The location of seven novel 2'-O-methylated nucleotides predicted by complementarity to C/D box snoRNAs were identified in human 28S rRNA. 2. Our data confirm the observation [2, 3, 9] that the RNA complementarity in the snoRNA is sufficient to specify a site of 2'-O-methylation. 3. The total number of 2'-O-methylations in human rRNA is not yet known. At present, considering that no ideal approach to localization of 2'-O-methylations is available, there are ~5 ribose methylations with unknown locations in human 28S rRNA. Unless described, all techniques for manipulating nucleic acids were performed according to standard protocols . Total RNA from human HeLa cells was extracted by the guanidine thiocyanate/phenol-chloroform method . Partial alkaline hydrolysis of RNAs was performed essentially as described , except that the hydrolysis was carried out by incubation for 30, 45 and 60 min at 90 C. For primer extension analysis, 5 μg of partially hydrolyzed or 2.5 μg of intact total HeLa RNA was heat-denatured (1 min, 90°C) in the presence of 0.2 – 0.5 pmol 5' end-32P-labeled oligodeoxynucleotide primer and allowed to cool on ice. Reverse transcription was carried out in buffer containing 50 mM Tris-HCl (pH 8.3), 4 mM MgCl2, 50 mM KCl, 1 mM each dNTP, 10 mM DTT and 20 units of M-MuLV reverse transcriptase (Fermentas) for 45 min at 37°C. Primer extension products were precipitated with ethanol and recovered for loading. The sequencing reactions were carried out with same primers on DNAs (generated by PCR) corresponding to 28S rRNA. The DNA sequencing reactions were performed by the dideoxy chain termination method with Thermo Sequenase™ (Amersham) and 33P-labeled dideoxyriboncleoside triphosphate terminators (Amersham). The primer extension products were resolved on a 7%/8 M polyacrylamide/urea gel alongside the sequencing reactions and visualized by autoradiography. Oligonucleotides were synthesized by GENSET SA, GIBCO BRL Life Technologies (U.K.) or SIGMA GENOSYS. The locations of oligodeoxynucleotide primers in rRNA are indicated in parentheses and correspond to 28S rRNA sequence occurring in GenBank under accession number M11167. To detect the methylation state of particular 28S rRNA nucleotides, the following oligodeoxynucleotide primers were used in primer extension and sequencing reactions: Am389 and Am391, 5' GTT TAC CTC TTA ACG GTT TCA CG 3' (405 – 427); Gm1604, 5' ACT TCG GAG GGA ACC AGC TAC TA 3' (1628 – 1650); Gm1739, 5' GCT TCT TAC CCA TTT AAA GTT TGA G 3' (1762 – 1786); Gm2853, 5' CGA CCG ACC CAG CCC TTA 3' (2870 – 2887), Cm3810, 5' CCC GTT CCC TTG GCT GTG GTT T 3' (3829 – 3850), Gm4156, 5' GCC TTA GGA CAC CTG CGT TAC C 3' (4176 – 4197). 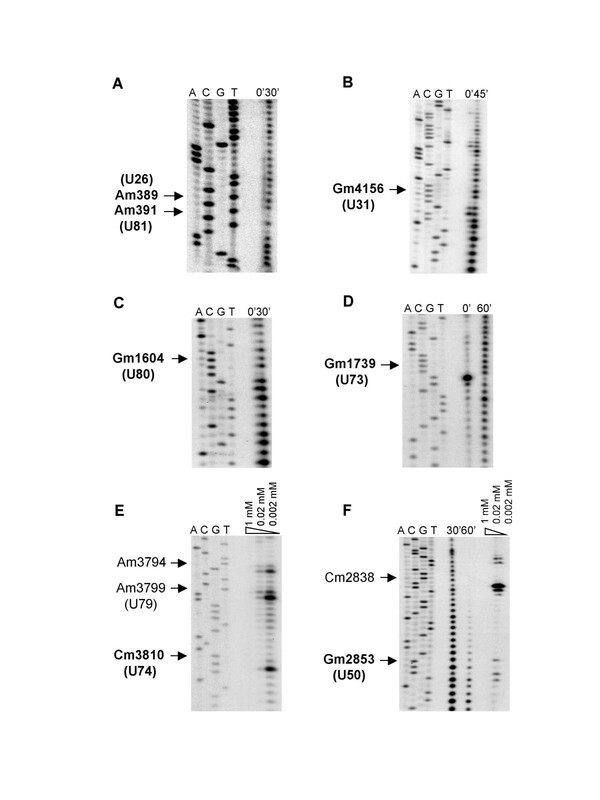 For generating DNAs corresponding to 28S rRNA sequences flanking the investigated 2'-O-methyalted nucleotides, the following oligodeoxynucleotides were used as PCR primers: Am389 and Am391, 5' GGT AGG ATC CAT CTA AGG CTA AAT AC 3' (306 – 330) and 5' GAG GAA TTC GGG GCG GGA AAG AT 3' (500 – 552); Gm1604, 5' TTA GGA TCC GAA AGA TGG TGA ACT AT 3' (1492 – 1517) and 5' TTA AAG CTT GAG AAT AGG TTG AGA T 3' (1749 – 1773); Gm1739, 5' CGA AGG ATC CCT CAG GAT AGC TG 3' (1645 – 1667) and 5' GAA TTG CTT ACC AAA AGT GGC CCA CT 3' (1828 – 1853); Gm2853, 5' CGC AGC AGG TCT CCA AGG TGA A 3' (2769 – 2790) and 5' CGA CCG ACC CAG CCC TTA 3' (2870 – 2887); Cm3810, 5' AAT GGA TCC AAA TGC CTC GTC ATC TAA T 3' (3743 – 3769) and 5' ATG AAG CTT CAC CGT GCC AGA CTA GA 3' (3894 – 3919), Gm4156, 5' ACC GGA TCC GGG GAC AGT GCC A 3' (4116 – 4137) and 5' GCC AAG CTT TCA CGG TCT GTA TTC G 3' (3894 – 3919). This study was partially supported by research grant No. 2491 from the Estonian Science Foundation and grant No. 0180518s98 from Estonian Ministry of Education. We thank Joan A. Steitz, Lara B. Weinstein Szewczak and Kazimierz Tycowski for critical reading of the manuscript and for helpful comments.